So, what happens to stuff that you have carefully arranged in the truck bed when it rains? Or how do you handle the scorching sun degrading the quality of your grocery in the truck? You can squeeze them all inside the car, or buy some nylon paper and cover them. Shady, right? I. Which types make the best truck bed tonneau covers sales? II. What is the importance of reading truck bed tonneau covers reviews? III. Which is the best truck bed tonneau cover? IV. Can I use accessories on my truck with a tonneau cover on? V. How to choose a truck bed tonneau cover? Among the most secure retractable tonneau covers is the Roll-N-Lock BT220A A-series. It makes it safe for you to leave your items ‘unattended.’ You may read top best retractable covers here. Roll-N-Lock tonneau made of a powder-coated sleek aluminum body is the most durable one you can get. With it, thieves have nothing on you; not even their sharp knives can cut it since it has no rubber exposed on the outer surfaces. It also has a functional tailgate locking system that lets you lock up when leaving your truck in public. Installing this USA product is easy; all you have to do is clamp it on your truck without using tools or drilling holes. Whenever you want to use the bed, you can open and close it with much ease, since it has a rotating lever for the retraction process. No lifting. The fact that the cover gives you easy access to the bed, whether partially or to the entire opening, makes it cool and convenient. This definitely means that the usage is straightforward and stress-free. Poor maintenance leads to fast degradation of this cover. It is, therefore, your responsibility to use, store and maintain it as per the book. Gator ETX cover stands out among other rolling covers because of its ability to accommodate additional accessories, the affordability, and quality it portrays. The best rolling cover in the market is this one from Gator, not because of how affordable it is, but thanks to its sleek, stylish design and adjustability. If you want it to fit tightly on the bed, or loosen up a bit because of luggage in the back, use the tension controls. When clamping it, you neither need special tools nor do you need an extra hand. It is lightweight and easy to install. The leather grain vinyl material makes it durable, stylish and weather-resistant. It provides enough security for your items, and you can access them whenever. You shall simply roll it and secure with straps before going about your business. It is adorable how easy it is to use this cover, especially when installing and rolling it. It is a chance for you to get rid of a tedious installation process, and instead mount the cover alongside other accessories you may have. When removing it, you may experience difficulty if it is wet. This is because water adds some weight to it and it does not dry up as fast as other concealments do. You have found it! Finally, a tonneau cover that is easy to install and remove when you have oversized cargo in the back. MaxMate Tri-Fold truck bed tonneau cover is made of steel clamps that mount easily on your truck without the need to drill holes. It comes fully preassembled, hence making the installation process simple. Moreover, it has crossbars that fold along with the cover anytime you want to leave the bed fully or partially open. The concealment is made of aluminum powder and marine grade vinyl, which make it last ages serving its purpose. The design is also sleek, so this is what you need if you are looking for a blend of style and sturdiness. You will love how easy it is to fold this item; its preassembled crossbars make it a smooth process. Also, the cover is made of sturdy material; thus, it remains durable and maintainable. If you have an over-the-bedrail bedliner, you will find it necessary to create small holes for it to fit suitably. Here is a solution for your constantly unsafe items in the truck. The cover has theft protection as the most attractive feature. BAKFlip G2 Hard Folding cover is designed such that you can fold it and leave it upright as you go about your business in the truck bed. Its integrated buckle system and prop rods make this possible, thus nullifying the need to remove it every other time. Its aluminum UV weather-resistant panels and seals improve its strength and enable it to withstand harsh weather. You will be jocund to know that it is durable, stylish and easy to install. Better still, it can be used alongside other accessories you may be having and have your cargo transported safely. The cover gives you full bed access when folded. Its prop rods remain upright when folded, thus does not hinder you or inconvenience you when you leave the bed open to load and offload your belongings. The cover is functional. However, you need to be careful in the wet season since too much water on the tonneau may sag it and let water into your truck bed. Drain water off it when you notice some on. This is the best tonneau cover to use if you desire to improve your mileage expenses by reducing fuel consumption of your truck. The cover has an aerodynamic design that improves your fuel economy incredibly; worth it! The design in conjunction with how tight-fitting it is when you adjust its pre-set tension controls makes it sleek and stylish. It is made of leather grain fabric in the USA for assured all-weather protection. Note that the installation process takes 20 minutes or less. With the top-mount design, it will be 1.5” above the rails, giving it a distinctive look. You shall use dual paddle latches on either side when closing this affordable cover and make it as fitting as you want to using the tension controls. The stylish look of this item accompanied with its grand aerodynamic design makes you want to break the bank to purchase it. Good news is that you do not really have to as it comes at a very affordable price. The cover can wear out really fast. This is especially true when you lack to implement appropriate maintenance procedures. It is up to you to keep it in good shape; otherwise, you will rock the road with a worn-out cover too soon. The most convenient retractable tonneau cover to use is the Pace Edwards Switchblade. You can operate it using one hand! The rack from Pace Edwards is one to enable you to turn your truck into a secure storage area. It attaches in minutes. The installation procedure is, and with the help of a Phillips head screwdriver and a 7/16” wrench, you can enjoy the good looks and efficiency that comes with the aluminum panels of the cover. These panels are bonded with Pace’s patented ArmorTek, a padded weather-resistant polymer. It is responsible for the security the cover provides and its calming soft look. The continuous tension spring makes it very easy for you to roll it in and out of the canister smoothly at your convenience. Storing it as well is easy. The polymer finish on the cover and its aluminum panels make it weather-resistant, durable and stylish. If these are not your cover goals, what are? You can also operate it with one hand if the other is full. The cover is very easy to use. However, you will need to have a Phillips head screwdriver and a 7/16” wrench to install; otherwise, the installation process could be tasking. 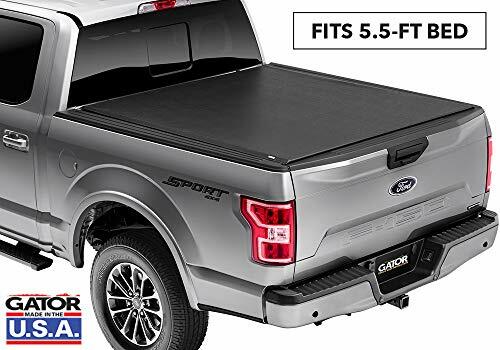 The best truck bed tonneau cover is not the one with the best looks, the largest or lightest, although these are pretty significant factors to consider. The most suitable one for you is one that will not hinder you from using your bed when you desire, demands less from you and serves you best. Consider the following factors when choosing a cover for your vehicle. 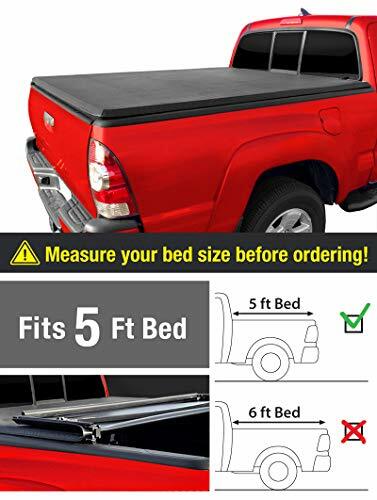 While at it, ensure that you are conversant with the bed size to avoid purchasing a tonneau cover that shall not fit best and make you regret your adorable efforts. There are basically four types of tonneau covers in the market. It is up to you to make a choice; you can read more on the types to get full insight o what you are getting you. Below are the common types. In this type, the cover rolls out of and back into a canister holding it. It is a good option if you always have your hands full since it can be operated using one hand on either side. You have the freedom to expose or conceal your luggage as you wish. For folding covers, you fold them from one end of the truck to the other, mostly in three sections. You can either have a soft or hard-folding option. It is suitable for you if you have awkwardly shaped cargo but still want part of the bed covered; so, you conceal just part of the truck. A rolling cover lets you roll it over to cover or uncover the bed. They are the easiest to operate and come at an affordable price. It is excellent like the folding cover, but this one gives you more space variances as it is more flexible. A hinged tonneau will have hinges on the front part of the bed so that you open them as you do with the door to the basement. They are great if your cargo is made of regular shape. If you need to keep opening the bed or have a large load with variant irregular shapes, this is not for you buddy. It could be costly, or not. Tonneau covers are made of different materials, and various modes of technology are used in the manufacturing process. These, together with the brand of the protection and additional unique features bring about a variation in prices. You need not break the bank for you to buy one. There are affordable options you can choose from our list and smile your way home. If, however, the price is not a big deal here, get any cover you want, having focused on more important factors. It is vital that you know how to use and maintain your cover. This will save you the disappointment of trying to fold a retractable cover or damaging your item due to lack of knowledge. Most of these products are easy to use. They also have special maintenance tips. For example, some need special soap to clean, while others cannot be stored unless completely dry. Assess how much effort you are ready to put into maintenance and make the most convenient purchase you can. 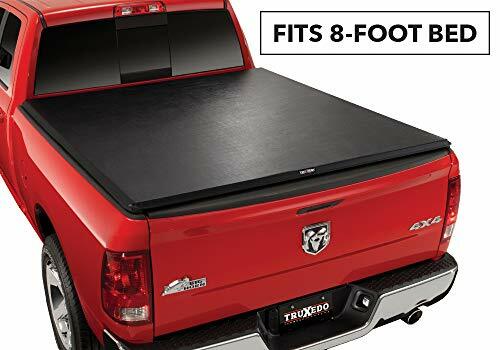 It is evident that truck organizational and packing tips are fundamental skills every truck owner should have, and tonneau covers are there to make this more possible. If you do not need to access the bed often and your items fit perfectly, get any cover you desire. However, it matters what cover you chose if you carry a lot of stuff in the bed, and have awkwardly shaped goods. In such scenarios, get a cover that can be opened halfway and allows easy access to the inner part of the bed covered. Does your cover require drilling of the bedliner to install, or is it a tool-free process? How long does it take to set up the tonneau and is it so hard? When you have such thoughts, you will definitely get the best cover with the most straightforward installation process for you. Most of these items come with straightforward manual and instructions. Do you really need this item? Are you tired of prying eyes and worrying of thieves stealing your cargo? Then you need to buy you a sturdy tonneau that has an integrated lock system and can withstand all weather conditions. Well, you can also buy it for the sake of covering your truck and standing out! In this case, look for sleek designs that give your vehicle that stylish look you yearn so bad. Look into how compatible the cover is to your truck. Factors like the accessories you need to move about with, size of the truck bed and size of the cover come affect the types of cover you shall purchase. If this part is rocket science for you, retailers and the internet are your best help now. It cannot be that hard to know the best tonneau cover to choose after reading through guidelines and instructions. Well, there are different types of tonneau covers for your truck as listed below. From online research on retailers, we are convinced that retractable, hard-folding and rolling tonneau covers make the most sales. This is because they are easy to install, give you full access to the truck bed and come at a pocket-friendly price. Their maintenance is also easy. It is durable, has an integrated security system and is very easy to use. Besides being able to accommodate accessories, it is adjustable, lightweight and affordable. It is weather-resistant, gives you full access to the bed and easy to use conveniently. Sure! But then, it depends on the tonneau cover you settle on. Top-mounted covers will not leave room for you to mount accessories since they already cover the bedrails. For most of those with an inside clamp-on design, you can use accessories since you have room on the bedrails. Ensure to look into such features before making the purchase. After all is said, it is your part to have it done. Acquiring the best tonneau cover may seem tedious at first, but now you know better. It is a stress-free process if you know what to look for. With our buying guide, why would you go wrong? Look into the mentioned factors religiously and get the most suitable product for you. 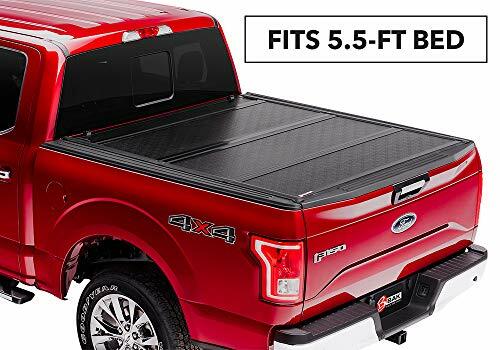 With the review of the top 6 tonneau covers on sale, you can rest assured that your truck bed shall be fine. Will it be a retractable cover, the hard-folding one or rolling tonneau? Let’s see.